There’s a perception that GIS and cartography have always struggled to adequately deal with and represent time. The notion that a phenomena that varies temporally is difficult to model perhaps gives rise to the idea that static layers are unable to capture such variability. If this ever were the case, it’s not so any more. Our ability to handle large temporal datasets in GIS is now well supported. 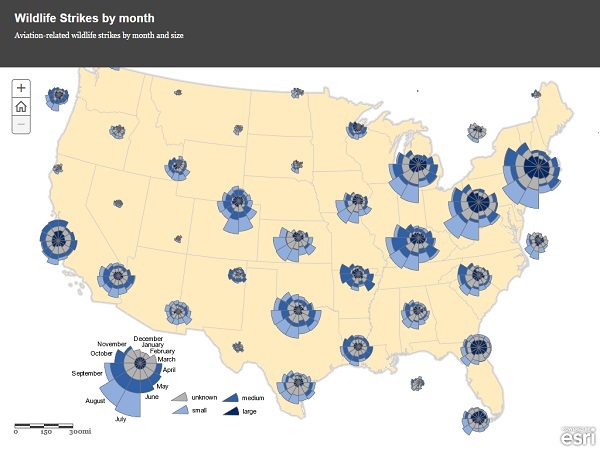 Adding time and date fields to data in ArcGIS allows you to configure and work with the temporal dimension including animating the map and controlling playback. Many online map services have a temporal aspect and it’s important to be able to reveal and make sense of this. Functionality is available across the ArcGIS platform to support temporal analysis and visualization. Creating animations of thematic layers only goes so far though, and sometimes it’s difficult to gain a detailed impression of the message in the map if you’re trying to assimilate a slice of your data from one time period with another that flashes briefly then moves to the next time period. A good example of this problem is the animated choropleth, where trying to build a mental picture of change over time is challenging as the map continually changes. Is this an insurmountable problem for cartography? Time is a hotter topic than ever and as the North American Cartographic Information Society (NACIS) prepares to gather in Pittsburgh in October for its annual conference, and the conference theme “Cartography and Time” reflects this. This coincides with the publication of Mapping Time from Esri Press, in which Professor Menno Jan Kraak explores the many ways you can map time using the classic mid-1800s map of Napoleon’s 1812 march on Moscow by Charles Minard (see below). Napoleon’s march on Moscow by Charles Minard, 1869. Here we’ll see how we can reimagine the temporal component using ArcGIS to build upon classic thematic cartographic techniques like the Minard map from a time gone by to add to the ways we represent time. These techniques give us a way of going beyond simply animating time-slices of data. First up is the space-time cube, created by geographer Torsten Hagerstrand in 1970 as a framework to study the social interaction and movement of individuals in space and time. The space-time cube adds a z axis denoting time to the familiar planar x,y coordinates we use. It’s seen sporadic use over the last few decades because of problems relating to its construction and usability. For instance, when you add multiple pieces of data it suffers from visual clutter and occlusion and estimating size and values are problematic, particularly when multiple trajectories are displayed together. They also struggle when you try and show multiple polygon layers together. For instance, when you stack layers on top of each other it’s only really possible to see the outer faces, and making sense of what’s going on inside a column of stack polygons is difficult. For that reason, space-time cubes of polygonal data should be avoided. 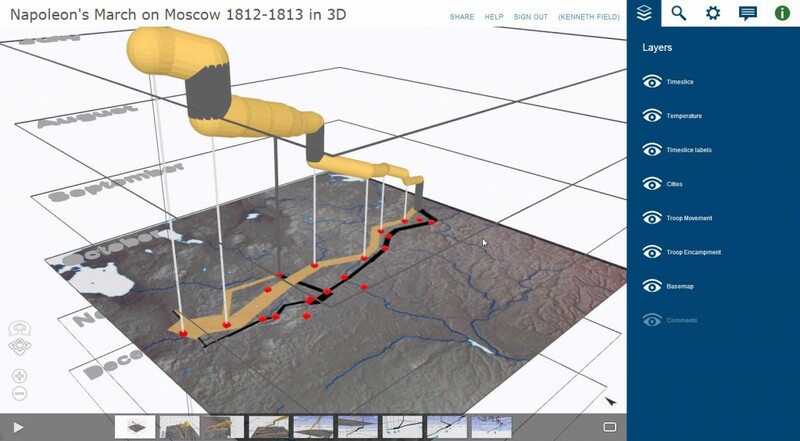 Using either ArcScene or ArcGIS Pro it’s possible to rebuild the famous Minard map as a 3D space-time cube which shows how the troops of Napoleon’s Grand Army were decimated by a range of factors during their 5 month advance and retreat. The original map is a classic of cartographic representation because of its simplicity. Transposing the temporal dimension onto the z axis and creating a space-time cube can give us additional insights. For instance, the flow line is now a proportional ‘tube’ and the vertical columns illustrate when the army was stationary. They spent several weeks in Moscow before retreating and if they had returned sooner they would have perhaps avoided the worst of the harsh winter which contributed to the deaths of many soldiers. This is an aspect not readily seen in Minard’s original. Because the space-time cube is published as a web scene on ArcGIS Online it’s interactive with pan, zoom, and rotate; the data for each segment of the flow can be retrieved by clicking. It’s a simple single linear feature and ideal for representing using a space-time cube. The temporal dimension of data can also be a great way of engaging with history, and Story Maps provide a terrific way of combining maps with other digital artifacts and a narrative to detail changes over time in an historic context. For instance, using the Map Journal App we rebuilt the Minard map to tell the detailed story of the march in collaboration with Lieutenant Colonel James McGhee, whose short book provides the narrative and imagery. This approach to mapping time allows you to move through the major stages of the march and learn of the trials, tribulations, and conditions faced by Napoleon’s men. 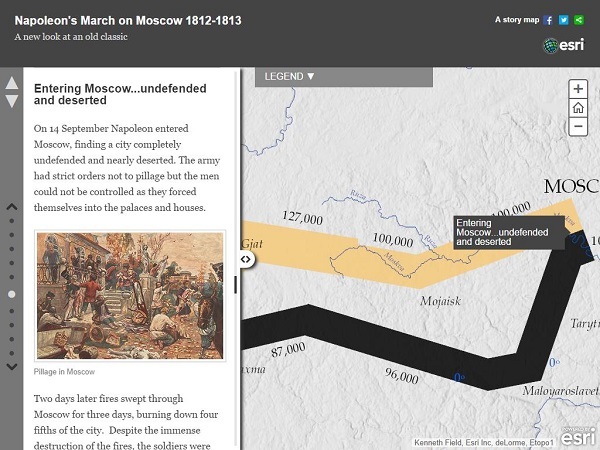 It adds detail to the map and provides a way of telling the human story behind it and is a valuable tool for educating. The Map Journal was also used to good effect to tell one man’s story in the World War I battle of Gallipoli in 1915. 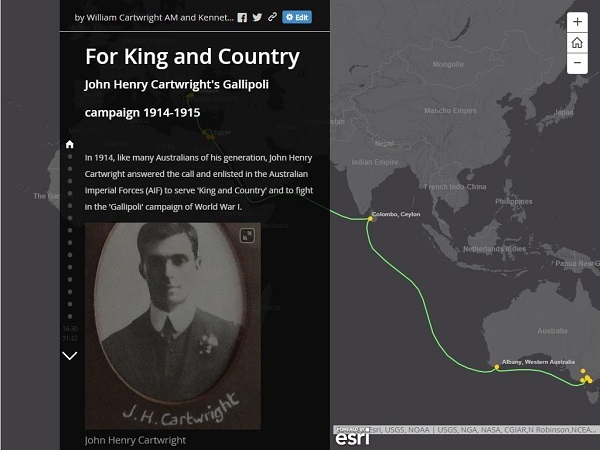 As we approach the centenary of the Gallipoli conflict, the ‘For King and Country’ Story Map follows John Henry Cartwright’s journey from a small town in Australia to the frontline, to his ultimate death and to the ongoing legacy memorial of his involvement. History, brought to life in maps. The Minard map aggregated data into a single thematic map, whereas the Cartwright map tells an individual story—both powerful ways of engaging with the horror of battle. 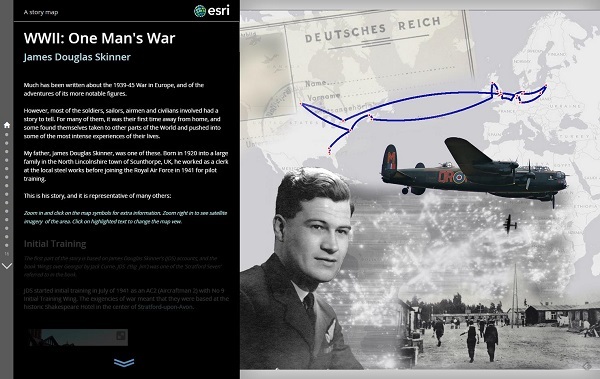 Andy Skinner (Esri Content Team) also used the Map Journal to great effect to tell the story of his own father’s part in World War II. The map is beautifully designed and again illustrates how powerful the map can be when integrated with a strong story and well-crafted visuals. Finally, Florence Nightingale, a British nurse in the Crimean War some 150 years ago, worked to improve sanitary conditions in military hospitals. Her reports included rose diagrams (colloquially referred to as a coxcomb)—an efficient, elegant way of representing the causes of mortality in the British army that supported multiple comparisons across time. 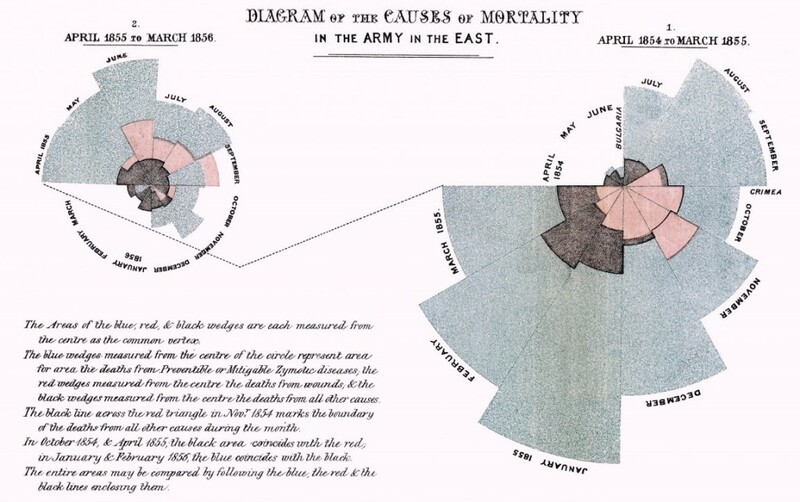 Florence Nightingale’s diagram of the causes of mortality in the Army in the East. The coxcomb is a simple yet effective technique for mapping multivariate data that exists at a point and also which varies over time. There’s a tool available for download that can prepare data and build coxcombs as features in ArcMap or ArcGIS Pro. Once the coxcombs are built they provide a way of displaying temporal data on the same display to support direct visual comparisons. Of course, they can also be animated. 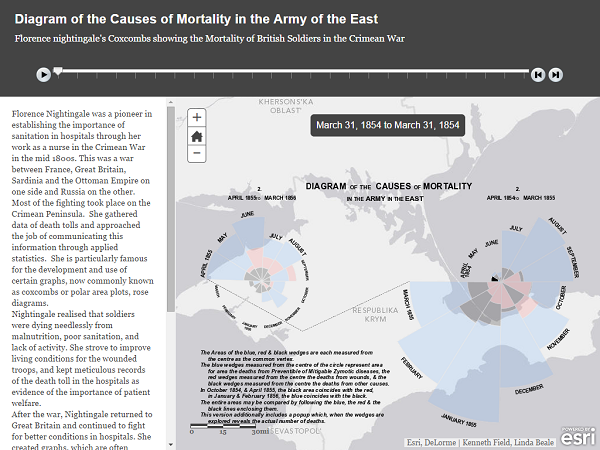 We’ve rebuilt Nightingale’s famous map to illustrate their use in ArcGIS Online. 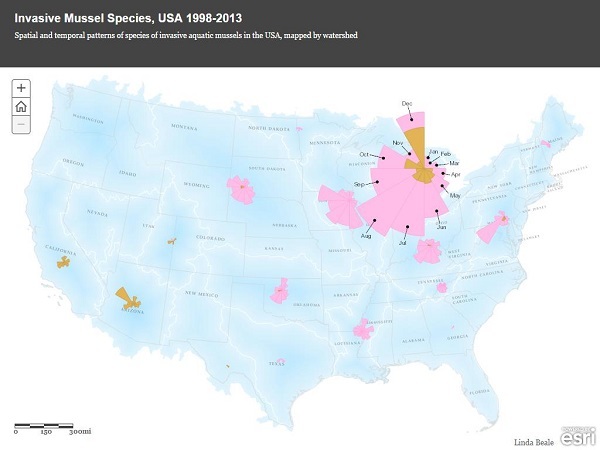 We’ve also used them to support analysis of the invasion of non-native aquatic mussels into the United States and to explore the spatial and temporal variations in wildlife strikes on civilian aircraft in the United States. From animating date and time fields, to being inventive with space-time cubes, Story Maps, and coxcombs, mapping time has perhaps never been as well supported. There are exciting ways that you can represent time cartographically and we look forward to seeing how you use these approaches and experiment with your own. Esri will be represented at the forthcoming NACIS conference to share our own work in this area of thematic cartography so if you’re heading to Pittsburgh we’ll gladly spend some time with you!